A research study on the global medical equipment calibration services market, published by Transparency Market Research (TMR), estimates this market to expand at a healthy CAGR of 10.10% during the period from 2014 to 2020 and reach a market value of US$2.1 bn by the end of the forecast period.The research report, titled “Medical Equipment Calibration Services Market - Global Industry Analysis, Size, Share & Forecast, 2014 - 2020”, states that the worldwide market for medical equipment calibration services stood at US$1.1 bn in 2013. 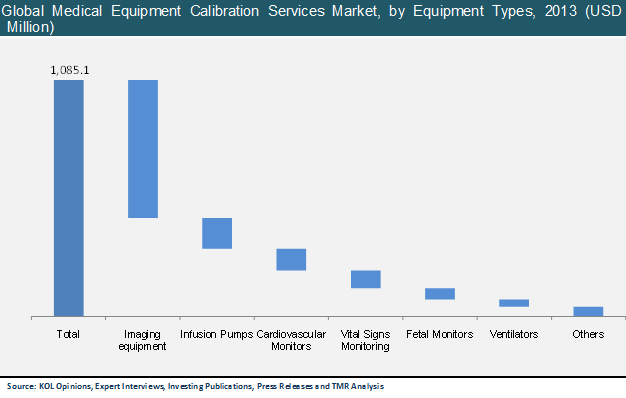 According to the report, the rising demand for innovative as well as advanced medical equipment and the increasing incidence of product recalls is projected to fuel the medical equipment calibration services market across the globe.The global medical equipment calibration services market is analyzed on the basis of the type of equipment and the type of service in this market study. Fetal monitors, vital sign monitors, imaging equipment, infusion pumps, ventilators, and cardiovascular monitors are the major types of equipment available in this market. Among these, the imaging equipment market is expected to acquire the dominant position, while the cardiovascular monitor market is likely to rise at a CAGR of 14.0% over the forecast period. In-house calibration services, OEM calibration services, and third party calibration services are the key services provided in the worldwide medical equipment calibration services market. The in-house calibration services market is leading the global market at present. However, analysts anticipate it to report moderate growth in the coming years, owing to the increase in the penetration of third party calibration services, which are slated to post the fastest development in the overall market during the forecast period. Considering its spread, the market study divides the global medical equipment calibration services market into the regional markets in North America, Asia Pacific, Europe, and the Rest of the World. The Europe medical equipment calibration services market stood at the leading position among all the regional markets in 2013.The presence of regional as well as international players in huge number, coupled with extensive research and development practices and strict rules enforced by governments related to medical equipment calibration, is fueling the market in Europe, says the report. Analysts at TMR expect this market to maintain its pace of growth during the forecast period. North America holds the second position in the global medical equipment calibration services market at present. It generated around 33% of the overall revenue produced in the global market in 2012.Of late, Asia Pacific has been showing a tremendous rise in its market share. The regional market is projected to register the fastest growth in the overall market over the forecast period. The increased awareness among people regarding the quality of services provided in hospitals and laboratories, together with stringent government regulations, is expected to drive the Asia Pacific medical equipment calibration services market significantly during the forecast period, notes the market study. The report also studies the competitive landscape prevalent in the worldwide market for medical equipment calibration services by analyzing the company profiles of the major players operating in this highly fragmented market.Biomed Technologies Inc., Industrial Calibration and Service Co. Inc., Fluke Biomedical, JM Test Systems Inc., Medserve Ltd., JPen Medical, NS Medical Systems, TAG Medical, STQC (Government of India), Transcat Inc., and Tektronix Inc. are some of the key participants in the global medical equipment calibration services market, states the report.